Have No Pockets? Strap Your iPhone To Your Chest | OhGizmo! You know what I don’t see enough of these days? Bandoliers. It’s already been proven that they are stylish, I mean just look at Chewbacca, Rambo and Worf (at least I’m pretty sure that thing was considered an ornamental bandolier). What’s that, you’d like to wear one, but just don’t have a good enough reason? Well have I got a surprise for you. 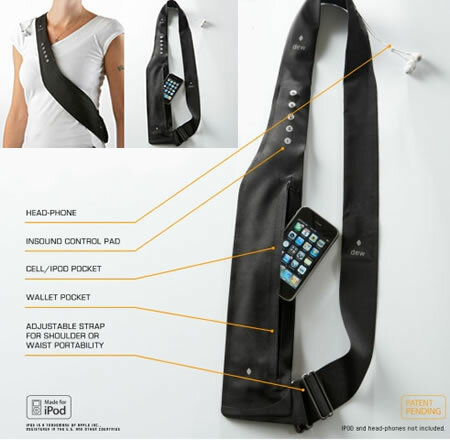 The Dew Quiver iPod Shoulder Strap is exactly what you’ve been looking for. Alright, in all seriousness, this thing is the fanny pack for the 21st century. No, that’s not some sort of compliment to the designers. Sure, it’s got a place to run the cord for your earbuds and build-in volume control. But this thing boils down to being the equivalent of a fanny pack. It’s not stylish, it’s just a big ugly pocket. Make that a big ugly expensive pocket, as it will set you back $85. I was laughing right along with the author of this until I got to the $85 price tag at the end. At that point, I started feeling a little sorry for all of the suckers that'll end up buying this ridiculous thing. Sigh. It kind of makes me want to dig through the boxes in my garage to see if I can find that old fanny pack from the eighth grade…. $85 is a bit much, as much as I like Chewbacca, I don't need to look like him. I didn't search for “iphone chest strap.” Your logic is flawed.